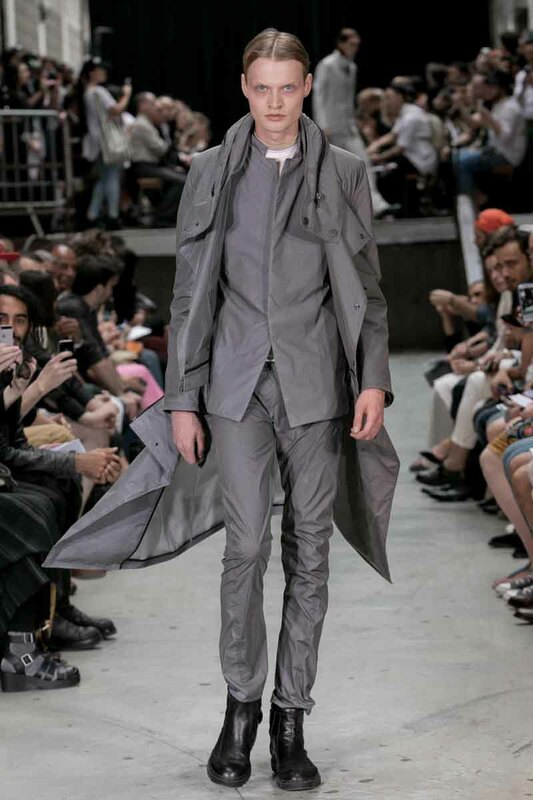 PARIS, Jun 27, 2014/ — Focusing on the regeneration of shapes and construction, Glenn Martens designing under the label Y/Project combined new cuts and volumes to create contemporary urban looks. “They’ve all raved into adulthood and are now veritable workaholics, respected, nailing every single step of their lives. Nevertheless, at times, it’s clear that they have not forgotten the explosive charges of their past,” he continued. Hence, it is not surprising that for this season, Glenn Martens chose a color palette that catches lights through an intriguing game of reflective materials, balanced with bright yellow, flashes of white and sand tones. A ‘trompe l’oeil’ effect of multicolored “faux-drapés” is the base of this season’s silk & jersey prints. Y/PROJECT SS15 is all about different types of linens: technically bonded, waxed and oiled. This playful game of coatings brings accents of lights and depths into the darker tones of the collection. Key-pieces go from reflective parkas, suede drawstring shorts, transparent cycling tops, denim perfectos, waxed leather jeans and jackets, paneled silk & linen trench coats and suits. Through a mix of expertise cuts and the elaborate choice of fabrics, the Y/PROJECT silhouette features elegant fluidity punctuated by razor sharpness. Graphic tailoring woven into structural elegance characterizes the Y/PROJECT signature design. Each collection bridges technical expertise and emotional atmosphere with a straightforward look. Culminating in architectural cuts that boast a comfortable fit, the foundation of Y/PROJECT resides and relies on transcendent versatility.